Takeaway #2: It is important to think about the continuum of care when planning for aging in retirement. There is a difference between the cost of care and access to care, and both need to be planned for. If we think about the cost of care, we know what care costs. Whether it’s assisted living, nursing care, in home care; we know those costs can be exorbitant in many cases. Many people end up on Medicaid because they have gone through assets paying for care. There is a broad spectrum of retirement communities. It is important to narrow down the choices and think about what’s often called the continuum of care. On the top bar in the table below, at far left you’ll see a minus sign, the green section, that represents independent living. If you are living on your own and maybe still very active, you would be on the far left of this scale. Then let’s say over time they start to develop some needs; maybe an hour or two of help around the house during the week. They then would be moving towards the right side of the green bar. The aqua color in the middle represents assisted living. Maybe they need help with bathing, dressing, eating and other activities of daily living. Then as you move on across to the right, you really get into more advanced needs; maybe in some cases needs that can’t even be provided in the home, at least not practically. The far right would represent 24-hour skilled nursing care. This represents the full spectrum. The reason this is important is that as your clients are looking at the different types of retirement communities out there, some providers focus on certain aspects of this continuum, while others may focus on other aspects. For example, an active adult planned community is a 55 and older development with clubhouse style amenities, maybe a pool, and maybe even a golf course. Residents own their home and everybody lives mostly independently. If a resident in a community like this develops assisted living or skilled care needs, it will not be equipped to provide for those needs. Independent-plus are rental retirement communities. There’s a month-to-month rent that includes meals, some housekeeping, and other services. In some cases, it might provide personal care services in their own home if they need it. Others may even have some assisted living units onsite, and even memory care units. That’s also called independent-plus because they have independent living plus some assisted living or memory care. But there again, if they have advanced healthcare needs, acute types of needs or skilled nursing needs, that’s not going to be available within those communities. At some point, somebody living in one of these types of communities may have to move again. That’s something important to understand because these kinds of moves can be difficult. Then you have assisted living and skilled nursing communities, they’re not even retirement communities even though they’re often referred to as retirement homes. 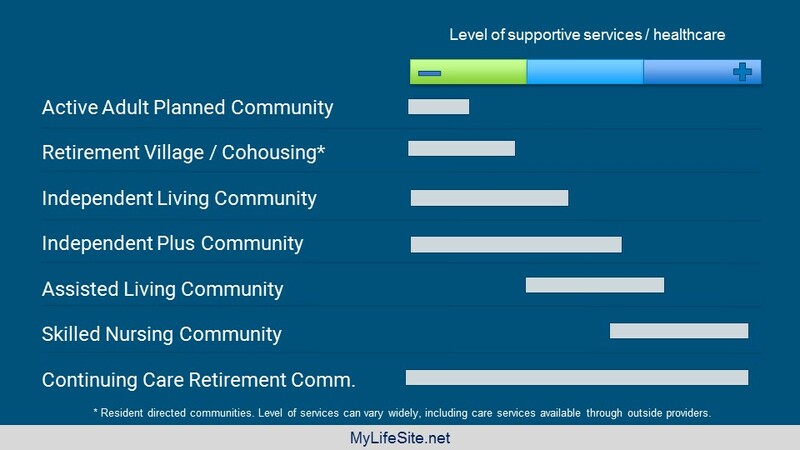 More and more people under 65 actually have to move into skilled nursing communities just for disabilities they have and 24-hour needs. Lastly, continuing care retirement communities are unique in that cover the full spectrum; everything from independent living all the way to skilled care. Residents typically move in when they’re healthy or independent, and as time goes on if they need services such as assisted living, memory care, or nursing care, those services are available in one location. Visit Retirement Insight and Trends, InFRE’s quarterly newsletter for retirement professionals, for a summary article of this presentation. Most senior adults prefer to stay in their home as long as possible – after all, home is where the heart is. Yet, this may not always be the most practical choice. Retirement professionals are uniquely positioned to prompt important discussions between senior clients and their family members about lifestyle, housing, and healthcare needs that may arise in the future. But with so many types of senior housing choices and considerations, how can you best guide your clients through the important decisions? “Where Senior Living and Retirement Planning Intersect, Opportunities Emerge” will help you understand the options, as well as key retirement planning implications related to the various senior housing choices. This webinar course is available as one of more than sixty Retirement Resource Center recorded webinar online courses for which you may receive 1 hour CFP®, CRC®, CLU®, ChFC®, RICP®, CASL, ASPPA, and other certifications continuing education (CE) credit. 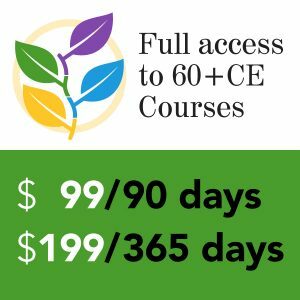 Courses are available individually, or become a member to have full access to all courses at a savings. 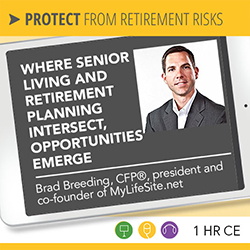 Brad Breeding, CFP®, President and Co-Founder of MyLifeSite, is a nationally recognized expert speaker on retirement planning and the senior living industry. 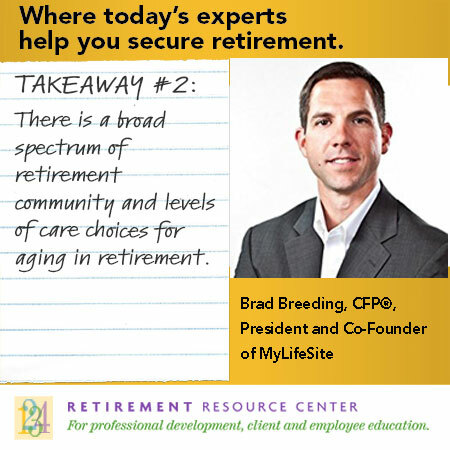 Brad’s financial planning background and extensive knowledge of the senior living industry allows him to provide valuable insights to those who are considering a retirement community, as well as to professionals who consult others in the decision process, including financial advisors, accountants, retirement living sales counselors, and others. We make it easy for you to stay on top of retirement and earn relevant CE. Takeaway #1 for Advisors: Should I age in place or move to a retirement community? 80 to 90 percent of older Americans say they want to remain in their own homes. What are the pros and cons of aging in place? There is a broad spectrum of retirement community and levels of care choices for aging in retirement. Takeaway #3 for Advisors: How can we evaluate senior living opportunities? Knowing how to age in place is really important for seniors who want to stay in their own home. Follow new takeaways on LinkedIn, Instagram, Facebook, Twitter, or by email notifications. ©2018, Brad Breeding. All rights reserved. Used with permission.